A lot of books out there. Which are the better ones? I was almost floored when I got it in the mailbox. Awesome work, the graphics is top notch, some pictures never seen. It's like a bible through the journey of Queen (but easy to read). And especially all the old posters, press kits, pictures squeezed between the informative text by Harry Doherty makes it a treasure. And like Brian May said on the release night: "A fantastic toy, a relic"
A must have in the collection. A perfect gift! I've been a Queen for an inordinate length of time and have read pretty much everything and anything published about them. There is a part of me that sighs when 'new' Queen books are released because we've read it all before, right? WRONG! This book was stuffed full of photos that I'd never seen before and contained insightful information that kept me enthralled. There was a warmth about the words and phrasing that made me feel that the author had a true 'feel' for this subject. It was tremendously well-researched and I was bowled over at the photos. Bottom line - I loved this book and would heartily recommend it to Queen fans with longevity of service and new fans alike. Last edited by TheHero on Sat Apr 01, 2017 5:58 pm, edited 1 time in total. This book contains the lyrics of all Queen songs. There is nothing special about that. Whoever got the albums, has the lyrics already. What's really special in this book after all, is that the book is packed with many amazing photos, art from the albums and hand written lyrics. All from the personal archive of the band. Most of the hand written lyrics were never seen before. The books is perfectly designed and looks very impressive. 1) The books contains no text besides the lyrics. I would have expected some behind the scenes stories, as how they got the ideas for the lyrics, meaning the lyrics had for the band members (if any), etc. The lyrics on their own are rather redundant, since you can find them in each of the albums. Needless to publish a book specially for it. 2) The book comes in paperback only. I still rate it 5, because the book is really beautiful, and worth the purchase even without any meaningful text. very good quality photos and a lot of pages; 144 of them. Poster of the guitar is included. This is an official book, written by Brian and co-author. 5 stars rating at amazon. "Let me preface this by stating up front: I am a rabid Queen fan, and an equally rabid fan of Brian May himself. That said, this book blew my mind in the very best way". This book is probably one of the best out there, maybe the best ever? electrifying live performances and beloved for their music". - In total 287 pages. - Reflections from Chris Squire (from Yes), Slash, Tommy Lee, Adele and more..
- Billy Squier (Rock guitarist, opening act for the North American leg of Queen's 1982 Hot Space Tour). Squier asked Brian May of Queen to produce his second album, Don't Say No. May declined due to scheduling conflicts, but he recommended Reinhold Mack who had produced one of Queen's albums, The Game. Squier and Mack went on to produce Don't Say No, on which Squier shared vocals with Freddie Mercury and drummer Roger Taylor. It became a popular MTV video. including Harry Doherty (the author of "40 Years of Queen"). As a music journalist Phil Sutcliffe wrote for Sounds magazine. He supported Last Exit by reviewing and praising them a lot. On 1976-12-05 he had a very good idea: he took Stewart Copeland (who was in Newcastle with Curved Air) to a concert of Last Exit. And he introduced Sting to Stewart Copeland. much more than in "40 Years Of Queen", which was a fine book too, but another concept. The book also comes with a discography, (review of albums), singles and live albums. It is not an official book, but it is much more detailed than any other book I have seen. The one piece of excellent news for Queen fans arrives in the form of a new coffee table book, Queen: The Ultimate Illustrated History of the Crown Kings of Rock. I can say without exaggeration that it’s the most exciting Queen release of the past 15 years. Lovingly written and compiled by journalist Phil Sutcliffe, Queen: The Ultimate… is 287 pages’ worth of illustrated beauty, featuring multitudes of photos of the band throughout their career — many of them previously unpublished — and scores of memorabilia: concert programs, posters, domestic and foreign 45 singles, LPs, backstage passes, ticket stubs…you name it, it’s here, and there are over 500 photos in all. It’s not just a pretty picture book, however: Sutcliffe has written quite the comprehensive biography of the band. 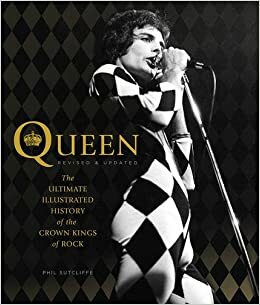 Sutcliffe isn’t the only contributor to the book; each album in the Queen canon is reviewed in detail by rock journalists such as Jon Bream, Jim DeRogatis, Gary Graff and Greg Kot, while close friends of the band offer personal recollections. One of the most touching essays comes from Reinhold Mack, producer of The Game, Flash Gordon, Hot Space and The Works: not only does Mack recount the band’s work ethic in the studio, but offers a number of personal photos of Freddie and Mack’s son, “Little Freddie” (I’m not making that nickname up) who was also Freddie’s godson. A Christmas card from Freddie to Little Freddie is one of the most touching inclusions. Having read numerous Queen books over the years, I thought I knew everything there was to know about this band — but Queen: The Ultimate… has provided me with new anecdotes and stunning visuals at every turn. It’s probably more than any casual fan of the band will need, but anyone with more than three or four Queen albums in their collection will find it to be absolutely indispensable and a welcome addition to their book collection. It is, quite simply, an absolute dream for all Queen fans. Has anyone got The Complete Illustrated lyrics book? TheHero wrote: Has anyone got The Complete Illustrated lyrics book? Yes and yes. It's ridiculously expensive but the handwritten sheets are worth it. Is that the book with the picture of John playing a Fender Rhodes on the 'You're My Best Friend' page? Nope - it's got John playing bass and wearing a hat during the 'Queen II' tour.